Firefox extensions has been a core part of this blog and I have been doing the Firefox Extensions: Picks of the Weeks series for alomost 2 years now. I love finding and sharing good Firefox add-ons. Mozilla has just made this effort of mine and plenty of others who share their love for Firefox with the community really easy and efficient. The ability to completely customize your browser with thousands of add-ons is one of the best features of Firefox, and highlights the talent, dedication, and innovation of our great community. Besides the Firefox Extensions: Picks of the Week series, Top Firefox Extensions is the place to visit. This is where my most favorite extensions are categorized and ordered and made easy for you to the find the ones you want. Firefox launched a collection of add-ons they recommended to new users as Fashion Your Firefox. Following its success, they have extended this ability to create and share their own collections with everyone. With the Firefox add-ons site’s new design, they have completely integrated Collections Directory showcasing popular collections and Editors picks. You can create a Mozilla account if you don’t have one yet. I created mine when it was required o login to download experimental Firefox add-ons (you don’t have to anymore). 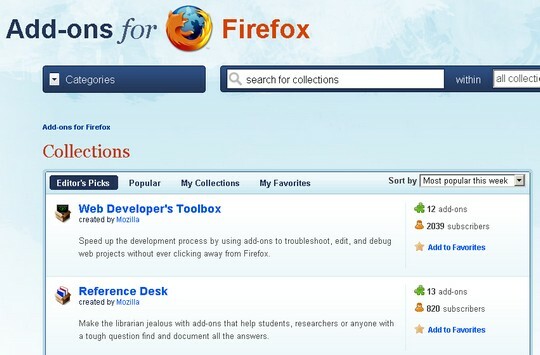 Once logged in, you can create your own Collections of favorite Firefox add-ons. You can use the Manage Collections link to add add-ons to your collection. We will see another convenient way to manage your add-ons shortly. Each collections you create could be given a unique name and a url so you can use that to share with others. You can also browse other’s collections shared in the directory. The power behind this concept is brought to the forefront by the Firefox Add-on Add-ons Collector. This add-on lets you add your installed add-ons to your Collections right from the Manage Add-ons window in Firefox. Another great thing is that this add-on lets you subscribe to others Collections and you can see updates to those collections. If you are used to referring to lists like Top Firefox Extensions, this is like RSS feeds for other’s collections of Firefox Add-ons. One thing I noticed about adding your installed add-ons to your collections is that, you had to subscribe to your own Collections before you will see that in the Add-ons window. Firefox add-ons Collections definitely fills a void in this huge community of developers and Firefox enthusiasts for sharing their favorite add-ons with the community. I hope you find some of these collections I shared useful.